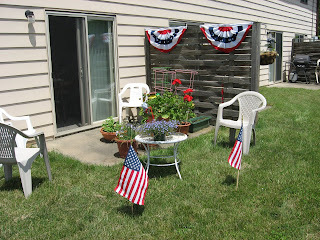 Here's our patio decorated for today. I love the red and blue flowers. I like to plant the blue lobelias with red geraniums. If you look closely you can see the pink tomato cages just behind the red geraniums. Aren't they a hoot. I have one in the car to take to sister Dody whose birthday is tomorrow, June 15th. Guess I'd better not tell how old she is. But I will say this, she's at the speed limit on Rt. 81. Welcome to our home. 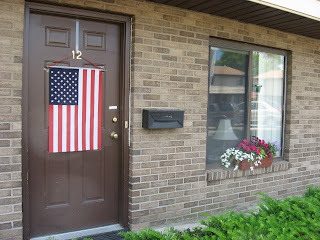 The flag's hung properly on the front door with the field to the left. I have a planter of shade loving flowers on the windowsill. If it ever gets hot we'll pop an air conditioner in the left side of the window. It's nearly time for a NASCAR race from Michigan. Do love to watch those boys keep turning left. But I still have time to sew a few more pieces.